Haffner Press » Haffner Press Newsletter – February 22, 2018 – Paul Pine at the Bindery . . .
At 928 pages, the next release from the Secret Moon Base of Haffner Press is our longest title to date! 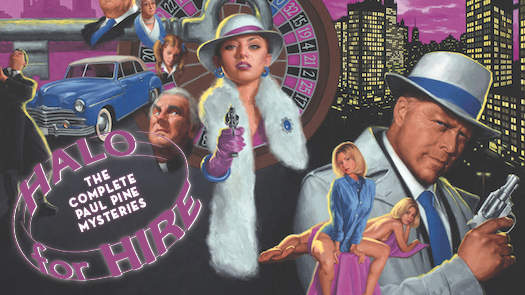 We want to give all of you who preordered HALO FOR HIRE: THE COMPLETE PAUL PINE MYSTERIES (first announced in 2012) a big THANK YOU for hanging with us while this tome came together. For those keeping score, editorial work began on these tales as far back as 2004. Frank M. Robinson, author of THE POWER and THE GLASS INFERNO (and Howard Browne’s office-boy at the 1940s offices of Amazing Stories) was originally on board to write the introduction, and the magnificent artist Glen Orbik was engaged to provide the cover painting. Sadly, both men passed away before they could contribute; Frank in 2014 and Glen in 2015. But time and tide wait for no one and popular culture historian (and unabashed fan) Richard A. Lupoff stepped up to do the introduction (and it’s fantastic!) for HALO FOR HIRE. An accomplished illustrator herself (your Big Poobah first encountered her work in 1997 for DC Comics), Laurel Blechman agreed to handle the cover art. Laurel and Glen have been a couple for decades and you may view much of their work at their website. Howard Browne’s daughter, Melissa Flagstad, provides an afterword and contributed a heretofore unpublished poem by the author to close out the book. 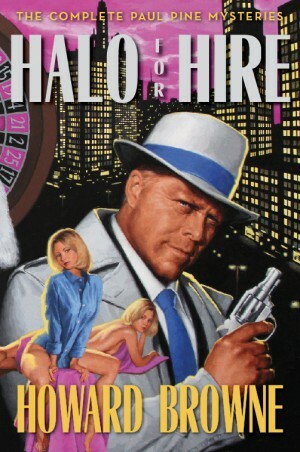 And to hep a few of you: that’s NOT Bruce Willis on the cover—Melissa’s husband, Trond Flagstad, lends his visage as the face of Paul Pine. Below is a link to preorder HALO FOR HIRE: THE COMPLETE PAUL PINE MYSTERIES at a pre-publication price of $50; the retail price upon publication will be $60, so don’t wait too long! It is hoped that we will have copies to show/sell at the Los Angeles Vintage Paperback Collectors’ Show in Glendale on Sunday, March 18th. We hope to see many of you there! “Exceptionally tough—and exceptionally good—opus peopled mainly by unpleasant characters and ending in fashion that may surprise all but keen-eyed.